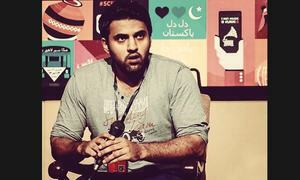 Entrepreneurs and founders of Ticket Kataao, Talha Zaheer (left) and Ahmed Farooq (right). The start-up’s first major client was Uber, which used this option to advertise their Uber Rikshaw service in 2016. Rickshaw owners were paid by Ticket Kataao; drivers were initially paid Rs 2,000 a month (Rs 200 a month was what they were paid to display the leaflets), but are now paid at least Rs 4,000. 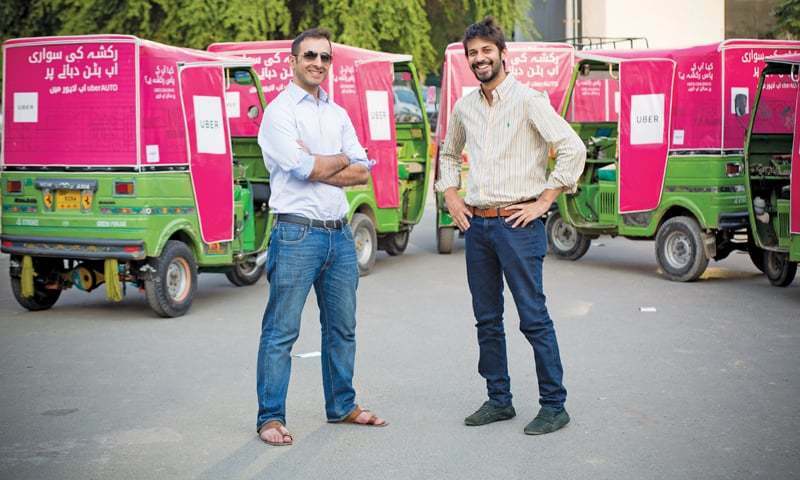 In 2015, entrepreneurs Talha Zaheer and Ahmed Farooq established Ticket Kataao, a start-up that specialises in wrap – or motion – advertising, which entails ‘wrapping’ rickshaws and privately-owned cars with advertising messages. The idea came to Zaheer when he saw rickshaws sputtering across Karachi with a few promotional leaflets and posters pasted on them. This led to the conception of the start-up’s first advertising solution – RAD (rickshaw fleet advertising) – and entailed producing customised hoods, displaying advertising messages and placing them on rickshaws (providing more effective visibility compared to the leaflets and posters previously used). The start-up’s first major client was Uber, which used this option to advertise their Uber Rikshaw service in November 2016. Rickshaw owners were paid by Ticket Kataao; drivers were initially paid Rs 2,000 a month (Rs 200 a month was what they were paid to display the leaflets), but are now paid at least Rs 4,000. Following the success of this initiative, Ticket Kataao introduced RozCar later that year, expanding the scope of their outdoor solutions to private cars and taxis. 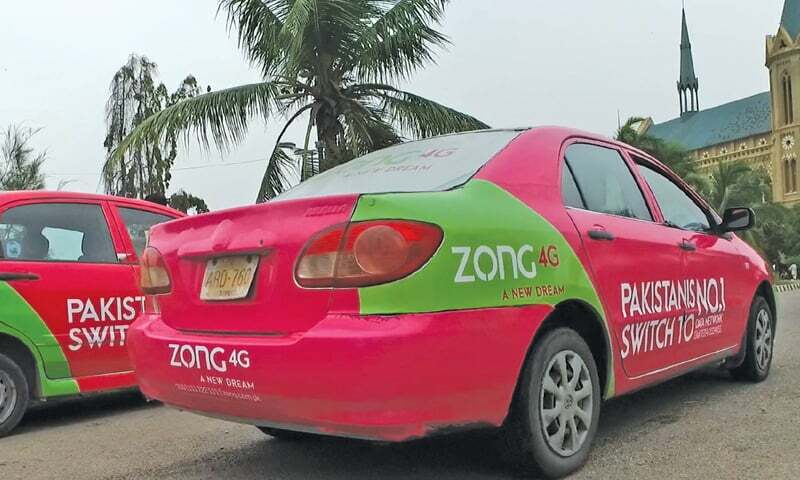 The first brand to come on board was Zong, which placed their advertising on at least 400 cars. Owners of small cars are paid up to Rs 15,000 per month. Sedan owners are paid Rs 20,000 per month and are required to drive up to 30 to 50 kilometres every day. Zaheer and Farooq confess that they had reservations about convincing people to ‘wrap’ their cars with messages, but to their surprise, within the first two days of their launch, 2,000 drivers signed up and this number has now grown to 7,000. “Once the advertisements are placed, the drivers are not just taking the message across town, but are also taking it to their homes, neighbourhoods and places of work – areas that no other form of outdoor advertising could previously reach. Our solution serves as a perfect guerrilla marketing tool,” says Zaheer, adding that their drivers are now called ‘brambassadrivers’. Ticket Kataao’s brambassadrivers have to do very little to register with the company; all they need is a valid driving licence and a car that is not older than 10 years. Once registered, drivers download the company’s app on their smartphones; their driving patterns (which include the areas they frequent, travel timings, and daily mileage) are recorded through the app and transferred into Ticket Kataao’s database. The company provides access to this database to their clients, who choose which cars they want their messages to appear on, based on the driving patterns that best fit their requirements. After that, the cars are ‘wrapped’ (customised) with advertising messages at Ticket Kataao’s expense, using a technique that allows the messages to be removed easily without affecting the car’s original condition. 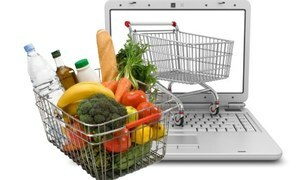 Ticket Kataao’s software also provides other benefits to their clients. These include allowing brand managers to track the location of their wrapped cars and, more importantly, the software provides measurability in terms of the number of impressions of their message, which are calculated by counting the number of people within a 150-mile radius of the car in question. “Given the population density of our major cities, the numbers recorded by the app are usually conservative given the radius limitation,” says Zaheer. 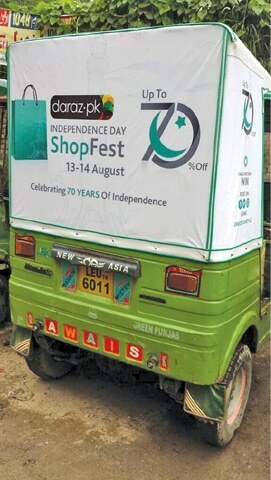 Farooq points out that converging motion platform with digital can do wonders for brands and cites Ticket Kataao’s recent collaboration with Daraz.pk as an example, which required people to photograph a car or rickshaw that promoted Daraz’s Independence Day sale earlier this year; the best photos were awarded prizes and discounts. A hurdle that the company continues to face is the absence of clear-cut taxation laws with regard to motion advertising. As far as branding rickshaws or taxis is concerned, Ticket Kataao are not liable to pay taxes or fees for these as they fall into the public transport category. However, as far as private cars are concerned, the laws are not particularly clear, and a fee is charged. Looking to the future, Zaheer is of the opinion that the number of billboards has reduced drastically in Karachi and motion advertising “has a bright future.” Furthermore, motion advertising is relatively economical; the lowest cost per impression stands at approximately Rs 48, giving it an edge over mainstream OOH. He adds that although creating awareness of this medium’s reach and engagement remains a challenge, motion advertising is undoubtedly an effective platform that marketers can creatively use to market their brands effectively. Better than those ugly billboards. Your business attempt is not original. My saying is why do something which isnt yours still keep leaping up the unknown infact someone else's hike. Do think your own ideas the original and get rights to it to sure that it belongs to you. like fonts. Theyre all copyright to the artist the caligrapher. so do businesses and its core concept protected by law for the creater. Dont be copy cat. Be creater. Brilliance in action... well done This too is innovation !!! Cant escape unwanted advertisment these days. I guess mobile phones were not enough now these eye sores on the streets! @Ali I like your reply , it was not there before now it’s there this is called creativity. Giving lion share to taxi owner also make the big diffrence in average life. @Ali who is steve jobs? And why should our ethnics depend on this guy?